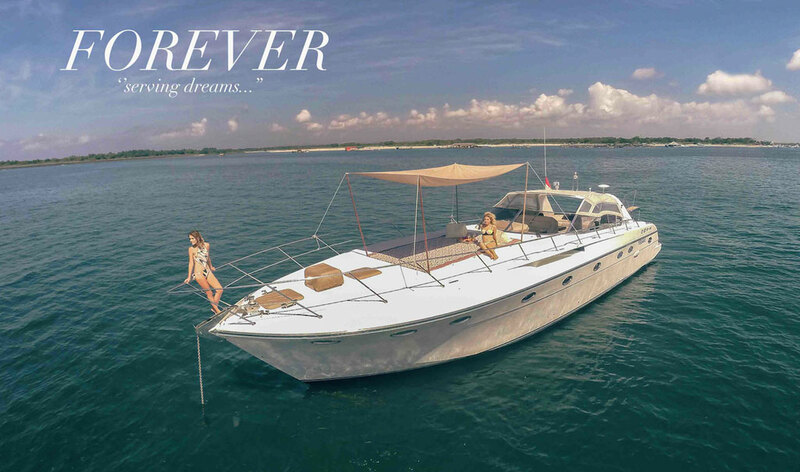 The Forever Rizzardi is an imported Italian Luxury Yacht. We offer full day trips to South Lombok, Kuta Lombok, Nusa Lembongan and Gili Air, departing from the marina in Benoa Harbour Bali. It is perfect for day charters for groups of up to 8 guests desiring a leisurely cruise of Bali’s water. The yacht can accommodate a couple in double cabins, plus two more guests in at win cabin for longer charters. Each excursion is tailored to your expectations: whether relaxing in the turquoise waters of a secluded anchorage or an action-packed onboard adventure. Chartering a yacht allows you privacy and the opportunity to decide on where you wish to explore to make the most of your holiday.